So, I went a little overboard with today’s picture. First off, I want to say that I’m having a lot of fun posting an actual new drawing every day. That’s what I’ve been doing lately, and I would love to continue doing this for a little while longer. 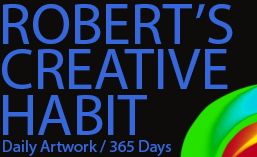 Epic projects are nice, but this Year of Creative Habits started out as a project that solely revolved around posting a brand new piece of artwork each and every day. So, again, it’s nice to occasionally find my way back to my original vision for this year long project. I think I went a little bit too crazy with that background, eh? 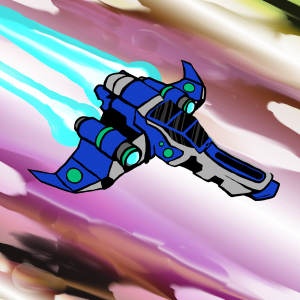 I decided to keep that background in the picture because it kind of mixes in my love of abstract painting with my cartoon spaceship. Sure, the two styles don’t really mix all that well (I don’t think so anyways), but that’s what creating things is all about really. Trying something new, and learning from it. So all of that being said, I love the actual spaceship part of the picture. It’s a little more detailed than what I was originally going for (I really can’t help it), and I’m not anywhere near bored of drawing these ships yet. There are so many more designs that I have on file (Once again, all from No Man’s Sky) that I would like to build. Today’s picture has been the biggest departure that I’ve taken from the original source material. I feel like I’m getting a feel for these ship designs, I’m getting more and more confident with adding my own details and ship features. Alright! Thanks for checking this out. That’s about it from me for today. There’s a little more than a month to go before my year is complete, and it would be kind of cool to continue moving forward by posting a completely new piece of artwork every day until I’m finished. Epic projects keep me very busy, and I really need to start thinking about what I’m going to be doing for my 365th post. I mean, to put it simply I guess I’ll go over my entire year and talk about my favorite pieces of artwork. But I feel it needs to be more than that… suggestions? I’m going to go ahead and leave a quote from my day 1 post, I thought it was kind of neat looking back and I thought I would share.